The electrical battery, first named by Ben Franklin, is a combination of two or more electrochemical cells used to convert stored chemical energy into electrical energy. Since the invention of the first voltaic pile in 1800, the battery has become a common power source for many household and industrial applications. This page contains definitions and advantages of battery technology used in ETI Products. Lead-acid batteries, invented in 1859 by French physicist Gaston Planté, are the oldest type of rechargeable battery. Despite having a low energy-to-weight ratio (next to the nickel-iron battery) and a correspondingly low energy-to-volume ratio, their ability to supply high surge currents means that the cells maintain a relatively large power-to-weight ratio. These features, along with their low cost, make them attractive for use in motor vehicles to provide the high current required by automobile starter motors. These batteries are often colloquially called sealed lead-acid batteries, but they always include a safety pressure relief valve. As opposed to vented (also called flooded) batteries, a VRLA cannot spill its electrolyte if it is inverted. Because VRLA batteries use much less electrolyte (battery acid) than traditional lead-acid batteries, they are also occasionally referred to as an "acid-starved" design. Wet or flooded (FLA) batteries require periodic topping up with electrolyte. This is the traditional technology for both starter and leisure batteries having been used for decades. Readily available worldwide for various leisure applications. When used in modern environments these batteries will normally only give you 70-80% of their rated capacity. The nickel-cadmium battery (commonly abbreviated NiCd or NiCad) is a type of rechargeable battery using nickel oxide hydroxide and metallic cadmium as electrodes. The abbreviation NiCad is a registered trademark of SAFT Corporation, although this brand name is commonly used to describe all nickel-cadmium batteries. The abbreviation NiCd is derived from the chemical symbols of nickel (Ni) and cadmium (Cd). There are two types of NiCd batteries: sealed and vented. A nickel hydrogen battery (NiH2 or Ni-H2) is a rechargeable electrochemical power source based on nickel and hydrogen.The difference with a nickel-metal hydride battery is the use of hydrogen in a pressurized cell of up to 1200 psi (82.7 bar). NiH2 rechargeable batteries possess good electrical properties which make them attractive for the energy storage of electrical energy in satellitesand space probes. For example, the ISS, Mars Odysseyand the Mars Global Surveyor are equipped with nickel-hydrogen batteries. The Hubble Space Telescope, when its original batteries were changed in May 2009 more than 19 years after launch, led with the highest number of charge/discharge cycles of any NiH2 battery in low earth orbit. The nickel-iron battery (NiFe battery) is a storage battery having a nickel(III) oxide-hydroxide cathode and an iron anode, with an electrolyte of potassium hydroxide. Active materials are held in nickel-plated steel tubes or perforated pockets. It is a very robust battery which is tolerant of abuse, (overchargeing, overdischargeing, or short-circuiting) and can have very long life even if so treated. It is often used in backup situations where it can be continuously charged and can last for more than 20 years. Due to low specific energy, poor charge retention, and its high cost of manufacture, other types of rechargeable batteries have displaced the nickel-iron battery in most applications. They are currently gaining popularity for solar voltaic backup applications where daily charging makes them an appropriate technology. Common AA cells (penlight-size) NiMH batteries have nominal charge capacities (C) ranging from 1100 mAh to 2900 mAh at 1.2 V, usually measured at a discharge rate of 0.2×C per hour. Useful discharge capacity is a decreasing function of the discharge rate, but up to a rate of around 1×C (full discharge in one hour) it does not differ significantly from the nominal capacity. The specific energy density for NiMH material is approximately 70 W•h/kg (250 kJ/kg), with a volumetric energy density of about 300 W•h/L (360 MJ/m³). Lithium provides the highest capacity (ampere-hours or "Ah") per unit weight of all metals, making it an ideal material for a lithium anode. Lithium systems offer distinct advantages over other battery systems, especially with respect to long life, reliability and capacity. Lithium batteries are disposable (primary) batteries that have lithium metal or lithium compounds as an anode. Depending on the design and chemical compounds used, lithium cells can produce voltages from 1.5 V to about 3.7 V, over twice the voltage of an ordinary zinc-carbon battery or alkaline cell battery. Lithium batteries are widely used in products such as portable consumer electronic devices. Lithium-ion batteries (sometimes abbreviated Li-ion batteries) are a type of rechargeable battery in which lithium ions move from the negative electrode (anode) to the positive electrode (cathode) during discharge, and from the cathode to the anode during charge. Lithium-ion batteries are common in portable consumer electronics because of their high energy-to-weight ratios, lack of memory effect, and slow self-discharge when not in use. In addition to consumer electronics, lithium-ion batteries are increasingly used in defense, automotive, and aerospace applications due to their high energy density. However, certain kinds of mistreatment may cause conventional Li-ion batteries to explode. The three primary functional components of a lithium-ion battery are the anode, cathode, and electrolyte, for which a variety of materials may be used. Commercially, the most popular material for the anode is graphite. The cathode is generally one of three materials: a layered oxide (such as lithium cobalt oxide), one based on a polyanion (such as lithium iron phosphate), or a spinel (such as lithium manganese oxide), although materials such as TiS2 (titanium disulfide) originally were also used. Depending on the choice of material for the anode, cathode, and electrolyte, the voltage, capacity, life, and safety of a lithium-ion battery can change dramatically. Recently, novel architectures have been employed to improve the performance of these batteries. Lithium-ion batteries are not to be confused with lithium batteries, the key difference being that lithium batteries are primary batteries, containing metallic lithium, while lithium-ion batteries are secondary batteries, containing an intercalation anode material. Lithium-ion polymer batteries, polymer lithium ion, or lithium polymer batteries are rechargeable (secondary cell) batteries, normally composed of several identical secondary cells in parallel addition to increase the discharge current capability. A compelling advantage of Li-poly cells is that manufacturers can shape the battery almost however they please, which can be important to mobile phone manufacturers constantly working on smaller, thinner, and lighter phones. These batteries may also power the next generation of battery electric vehicles. The cost of an electric car of this type is prohibitive, but proponents argue that with increased production, the cost of Li-poly batteries will go down. Batteries are Available in Several Mounting Configurations. 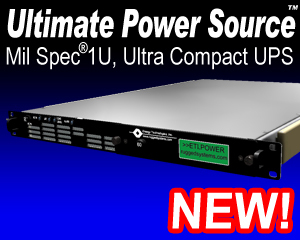 Click here for more info on Rackmount & Tactical Portable Battery Modules.